Football …. a sport like none other. It brings excitement, but for those that play it they will tell you that it’s not for the faint at heart. The passion for the game is the driving force for the players. It makes them want to play and not look at what could happen from a negative standpoint. They look at what football creates. Champions are not born but they created. They are created in the long summer, hot, humid nights when others are sitting in cool houses and the boys are committed to being safe all while practicing in hot conditions in pads and helmets. They work to keep hydrated in the midst of running plays and conditioning. Their focus is on what lies ahead and not on the current weather conditions. They understand their bodies will adjust and the heat is one thing that comes with the territory. In other words heat comes with the territory of influence, leadership, and greatness. Champions are created when they take their first hit. For some it’s their first time and for others they forgot how it feels. They quickly remember it doesn’t feel good. It doesn’t cause them to back away from a challenge but they learn strategy to be able to avoid some hits and endurance to take those that can’t be avoided. It’s teaches them to get back up when they fall because they will. Hits in their eyes does not equal quitting. In others Words when you fall, get back up again. Champions are created through teamwork. They are created because although the running backs name will be called and it’s the quarter back that gets the first interview they know and recognize that nothing is done or accomplished without team effort. It takes a team to win and without everyone doing their part there is no gold in sight. In other words great things are never accomplished alone. The one in the spotlight has a tribe behind them. Champions are created through perseverance. A fumble, missed tackle, or an interception isn’t the end of the game. If you know that you messed up you recognize there is no time for defeat. It’s time to hold your head up, get back in the game and fix what you did wrong and push to the end. We fall, we fail but you must keep going. Quitting should never be an option. Champions are created through perseverance. The hot summer nights gradually turns into rainy practice days, and cold dark winter temperatures. Practices that are held under the lights and running is the only thing that keeps you warm. It doesn’t make you think about quitting it makes you think about going out giving it your all because you have a game to play. The focus isn’t the obstacle but the victory! Champions are created through focus. The coaches are yelling the fans are cheering but the mission is on the field. There is one focus, one mission and to do that you must be focused on the play at hand and not the noise from the sidelines or fans in the stand. In other words don’t get caught up in the distractions. Stay focused. I am a CHAMPION! Football builds CHAMPIONS not on the outside where everyone sees but on the inside where it counts! The character, integrity, perseverance, endurance, teamwork, discipline and passion that it takes goes beyond words. Football the game for champions. The game that teaches boys to become men, and how to be productive citizens, and the leaders of the next generation. Congratulations to the 2018 Bengal Mini Might team. We have learned some valuable lessons of life this week and it has been an honor to write. I salute the boys , the coaches, team moms, and staff for your hard work. It wasn’t hard to write because of all that you have exemplified on and off the field. Now get your mind right, bring home the GOLD and lets NON STOP POPPIN IT TODAY! I am Ty Ziglar and I’m signing off from ….. 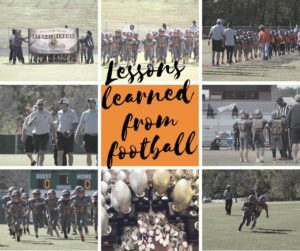 Lessons from football. POP POP!